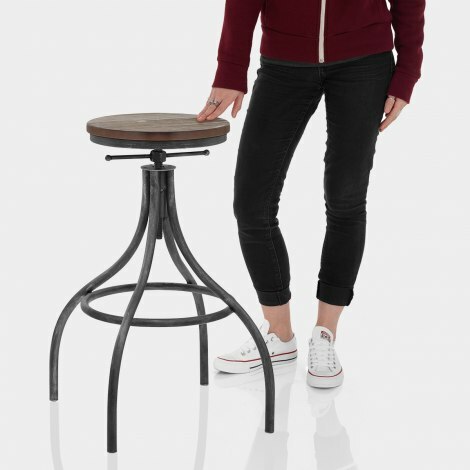 The Arc Stool Gunmetal is an eye-catching design with rustic antique style. Its undeniable charm and original character pairs with a variety of practical features, making the Arc an ideal choice, particularly for settings with a vintage industrial theme. Displaying a dark finish, the round pinewood seat has a backless design for a neat look. 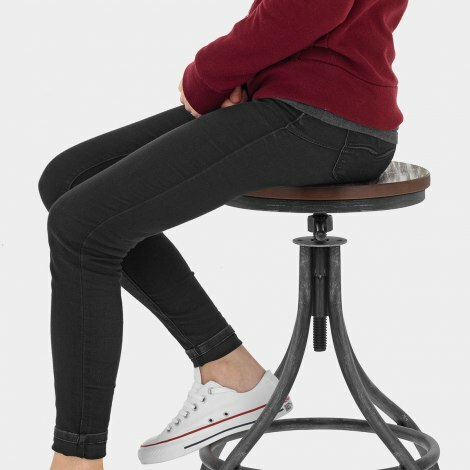 Beneath the seat is a lockable screw thread to allow for adjustable height and also a 360-swivel function. The industrial style frame is enhanced with an antique gunmetal finish that contrasts with the seat. The four legs of the steel frame curve outward as they meet the floor and are connected by a circular bracing bar footrest for extra strength. Finally, pads on the underside of the legs protect your floors.